Remaining on the cutting edge of treatment and technology is important to us at Caron and Jones Dental Care as we are always on the lookout for better patient experience. The future of dental technology is bringing revolutionary changes for dentists and oral surgeons, but for patients the upsides are simply, less time and less discomfort. Our technology sets us apart as only 5% of all dental offices in Indiana have this many advancements! With CEREC Technology, crowns are complete in one day! We have the technology to digitally scan your teeth and make a crown in less than an hour. CEREC stands for Chairside Economical Restorations of Esthetic Ceramic and is a state-of the-art method for reconstructing tooth restorations. CEREC uses computer-assisted design (CAD) and manufacturing (CAM) to offer single-day restorations for patients. ClearCorrect clear aligners straighten teeth invisibly, without metal braces. They simply apply pressure to naturally move the teeth and reshape the supporting bone. Clear aligners show off your smile, so most people won’t notice you’re wearing them. It’s easy to remove aligners to clean and eat whatever you like. They are made right here in America! Florida Probe is a probing and charting software to detect and diagnose periodontal disease. The computer software records and compares your pocket depths and bleeding numbers over several visits and helps track your health. This way, we make sure things are trending toward good dental health then detect and recommend the appropriate treatment as early as possible to avoid expensive or involved treatments. Dental Implants are screw-replacements for the root portion of missing teeth. They restore healthy smiles when patients have missing teeth. This modern dental technology can restore your quality of life with teeth that are strong and look and feel natural. 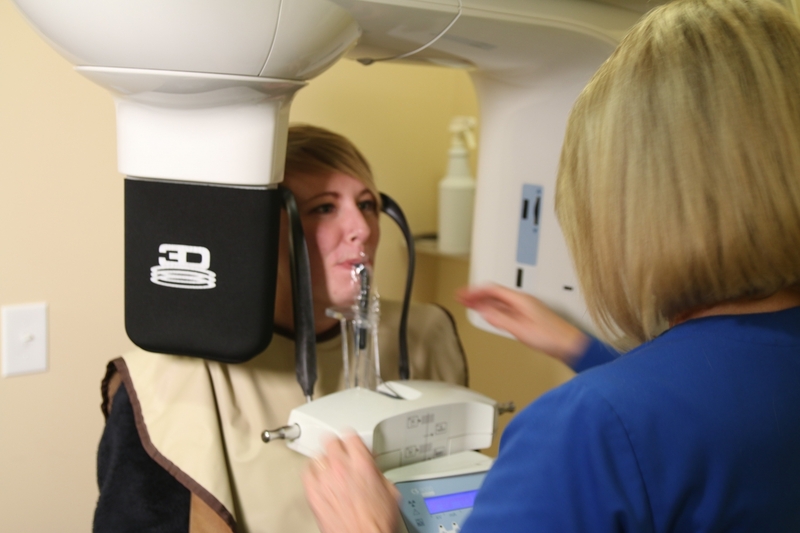 Digital x-rays are faster and contain less radiation than traditional x-rays. Cone beam CT generates three-dimensional (3-D) images of dental structures, soft tissues, nerve paths, and bone in a single scan. Images allow for more precise treatment planning. An x-ray beam shaped like a cone is moved around the patient to produce high-quality images. Results provide a more thorough evaluation of the jaw, dentition, bones of the face, nasal cavity, and sinuses with a much lower radiation exposure compared to conventional CT.
During a cone beam CT, the C-arm rotates around the patient’s head in a complete 360-degree rotation while capturing many images from different angles to create a single 3-D image. Photo above. Dental lasers have been around since the 1990s. They are used to improve efficiency and discomfort in procedures such as filling cavities and reducing tooth sensitivity. What it means is less time and less pain. These modern lasers are virtually pain-free, removing the need for numbing injections or pastes. They are quicker than the standard drills currently used in dentistry.